Staying fit and healthy is beyond doubt very important in the ever-busy modern world, but not all of us are outdoor sports enthusiasts willing to forgo the comfort of our homes over some heavy sweat, highly risky adventures and tough-looking muscles. That’s why the First Degree Fitness Newport is here, to keep you fit as a fiddle and stalwart as Apollo without the need to sign up for the gym or engage in some dangerous outdoor sport activities. 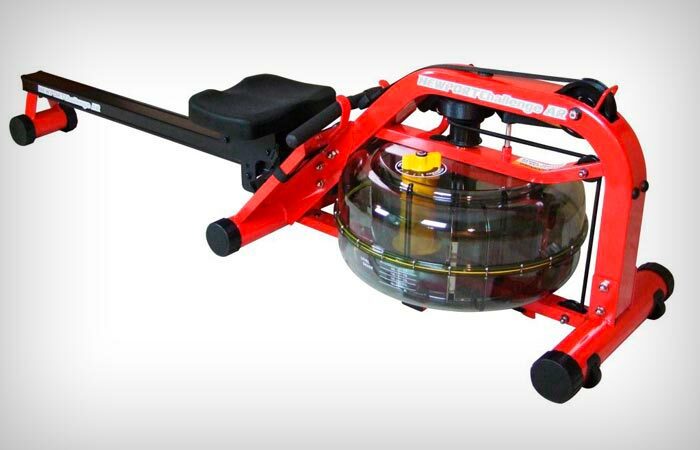 With its tough polycarbonate-shell tank that can take in 9-17 liters of water as the perfect natural resistance matter, this ingenious rowing machine uses the innovative fluid resistance technology to provide more resistance than most other similar machines available on the global market. The First Degree Fitness Newport features a rigid and durable steel/acrylic frame construction with a triple-bladed stainless steel impeller and a paddle with ergonomic handle to prevent excessive hand sores and arm muscle strain. On top of that, this ultimate home rower packs a set of built-in transit wheels, advanced heel cradle footboard with height-adjustable footplates and straps for optimum foot placement coupled with a comfy and stable saddle fixed to an anodized aluminum rail with precision bearings and air-glide Delrin® low friction seat rollers. 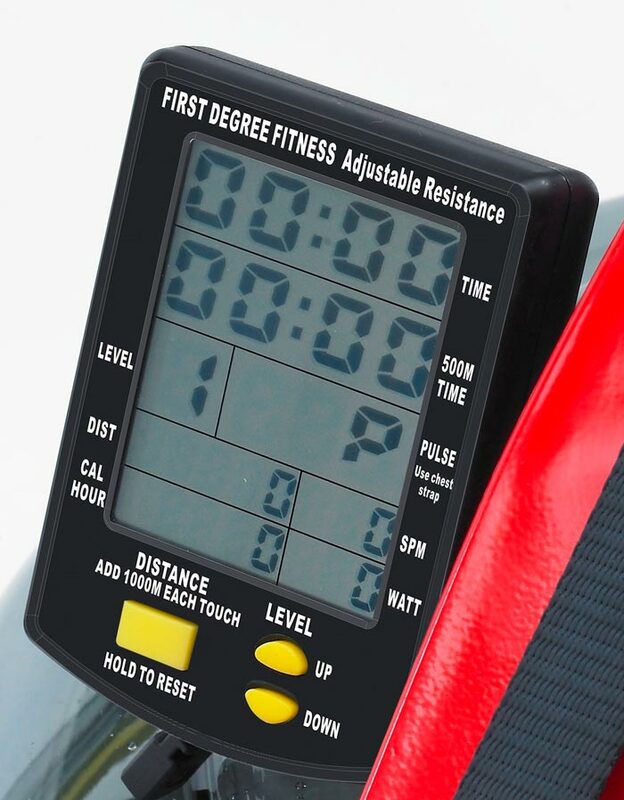 All this rowing goodness is topped by a durable belt drive for smooth, clean and maintenance-free indoor rowing and an improved pulley system which, unlike most air rowers, provides constant tension and recoil action all the way through the stroke. For best-suited training, First Degree Fitness Newport comes with an upgraded performance monitor program and multilevel computer display with USB port screens that deliver info on time, distance, 500 meter-split-time, calories per hour, strokes per minute, used wattage, interval training and even optional heart rate monitor pairing capacities. By a simple turn of a dial, you can choose between four different resistance levels to match your fitness needs without having to top up or reduce the water volume in the tank. Exercising with this smart indoor rower is enjoyable, smooth and jerk-free and the assembly process is minimal, requiring virtually no previous technical knowledge so you don’t have to worry about complicated setup procedures. 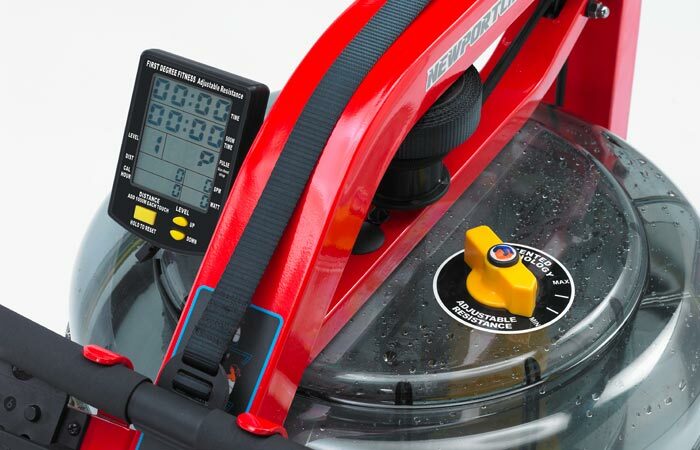 Measuring 78 x 20 x 21 inches (D x W x H) and weighing around 60 pounds, First Degree Fitness Newport can take up to 300 kilograms of user weight. Thanks to its ingenious space-saving design, this small solid rower is incredibly light and easy to move around and it can be stored in an upright position to minimize the necessary storage area footprint (packed size totals as few as 21 x 20 inches). Built to last and to keep you fit a lifetime, First Degree Fitness Newport is the perfect way to stay healthy and in shape all through the year, and it’s incredibly fun to train on too, so make sure you give it a go in case you’re not a big lover of outdoor adventures.